TO UNLOCK THE SERIOUS REVENUE IN YOUR BUSINESS? MEGA-SCALE YOUR MOST PROFITABLE CAMPAIGNS EVERYWHERE ON THE WEB. ​You Need To Reach The Next Level. Imagine being able to put your offer in front of other companies 1st party data (that’s their custom audiences of buyers) and lasering in on prospects who are showing real buying intent for your offer in real-time. Custom audiences is the reason you’re crushing it on Facebook… Now it’s time to ramp that up and unlock the serious revenue that comes with being able to truly identify an endless stream of real buyers. And that’s not the only thing that helps us generate bigger ROI. > Catch your customers at the right time during the buying process. Facebook and Google are closed gardens. You can only make the sale on their platforms. With us, you have 95% of the entire internet open to you. > Your message on every device. We tag every device your prospect uses to make buying decisions. You don’t lose them when they switch from smartphone to tablet. > Campaigns that really scale. Your campaigns get stronger as they age and we collect more data points to build stronger custom audiences. No more campaigns that stagnate or plateau as you increase your ad spend. 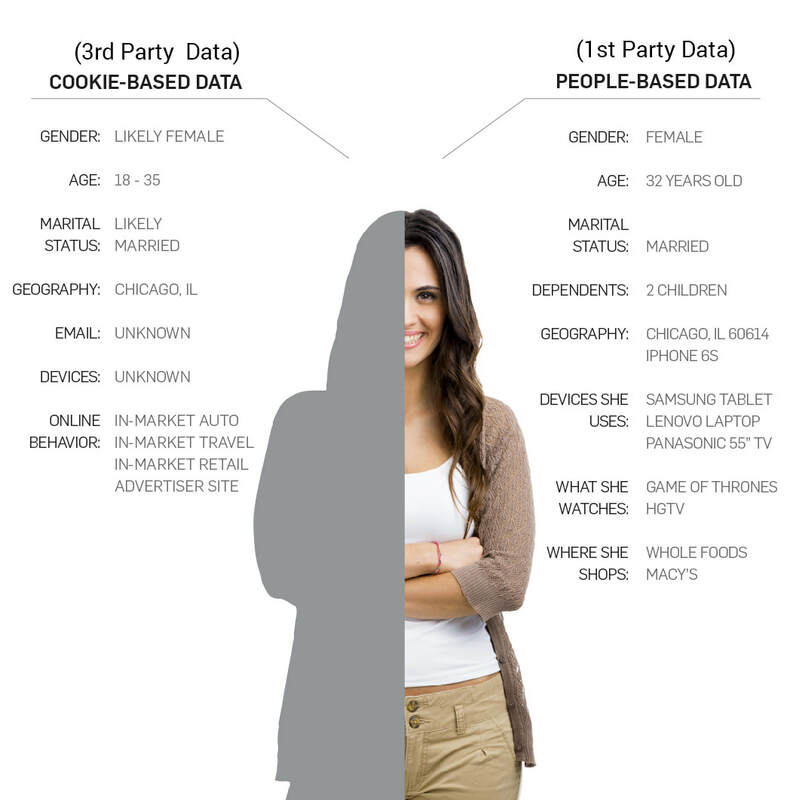 Businesses collect 3rd party data on historical buying habits. 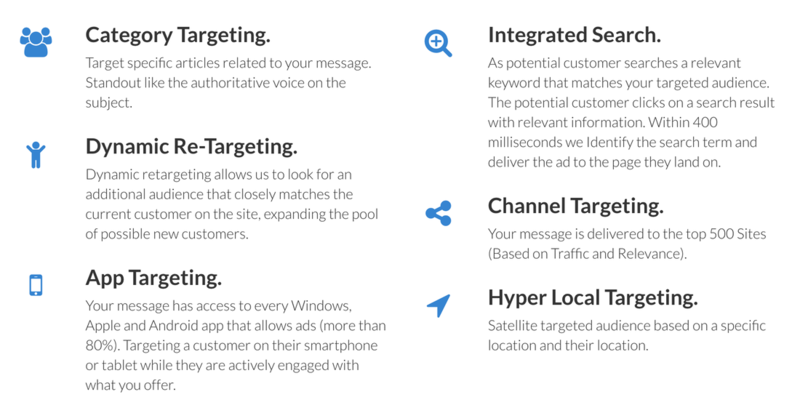 Big lists of prospects in your space are built and tagged as consumers for certain products/services/offers. Problem is these lists age, they become inaccurate and names stay on them forever. This allows us to quickly identify all the new prospects coming into the market and continuously increase ROI for our clients as your ads are always in front of fresh prospects. And You Can Know A Hell of A Lot More Than Them With Us On Your Side. Your competitors are using a cookie-based model to target consumers across all their devices but it’s a dated approach that wastes valuable advertising dollars. 75% of cookies are deleted every month. Two thirds of IP-connected devices don’t even accept cookies anymore. With 1st party data from real people, we build the rich profiles of individuals that want what you have and engage them with messages that resonate. A people-specific advertising approach allows you to understand that each individual in your target audience frequents digital platforms differently, has unique interests and lives a different life. “We’re here to help you reach the right person, at the right time, anywhere and on any device. As a company, Direct AIM Media aims to be human, fun, evolving, accessible and inherently interesting. Our team is at the heart of these beliefs. 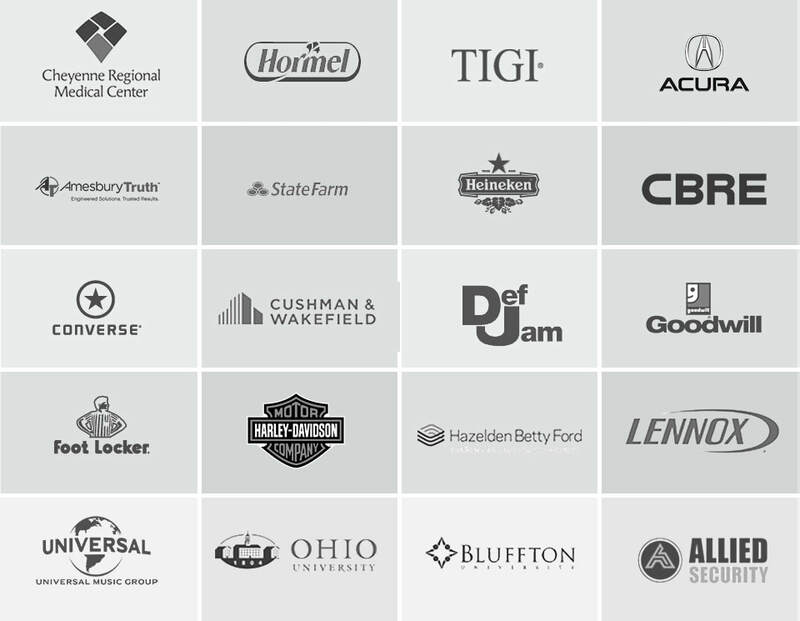 We are committed to being first to market with the technologies and systems that solve today’s marketing trends. Our data - also human, evolving, and inherently interesting - is just an extension of our company’s values. It has the power to connect, convert and exceed your marketing objectives.